When Hazel Krasinski as born on February 16, her daddy was so excited he quickly tweeted the news of her arrival to the world. Little Hazel was only moments old when her daddy, actor John Krasinski, wished her “Happy bday!” and described himself and his wife, actress Emily Blunt, as “incredibly happy” at the arrival of their first child. Blunt, 30, and Krasinski, 34, first started dating in2008 and announced their engagement a year later. They were married in Como, Italy, on July 10, 2010. Little Hazel has a whirlwind childhood to look forward to; her parents are a dynamic duo in the entertainment industry. Blunt was born in London, England, the second of four children. Her mother was a schoolteacher who had once acted and her father a very high-profile barrister in the United Kingdom. At 16, Blunt enrolled in a private college known for its performing arts program, where she soon caught the attention of an agent. Her debut performance cast her opposite one of the greatest names in British stage and screen -- Dame Judi Dench -- in a stage production of The Royal Family. Her television debut came in 2003 and movies came along in 2004. She’s earned award nominations and critical acclaim for her work in all three genres where she’s portrayed characters as diverse as an ancient Celtic warrior queen, Queen Victoria, a lesbian, a ballet dancer, Miss Piggy’s receptionist, and a superhero. Meryl Streep and Anne Hathaway enjoyed the leading roles in The Devil Wears Prada but Blunt’s performance was so impressive that the magazine, Entertainment Weekly, named her Best Female Scene-Stealer. The British Academy of Film and Television Arts (BAFTA) presented her with the Britannia Award in 2009 for British Artist of the Year. Krasinski, from Newton, Massachusetts, is the youngest of three sons. His first on-stage performance was in a 6th-grade production of Annie; Krasinski played Daddy Warbucks. Before graduating from high school in 1997, he starred in a play written by his classmate, BJ Novak. The two school chums worked together again several years later in the highly popular TV comedy, The Office. At Brown University, Krasinski studied theatre arts and then went on to the National Theater Institute in Waterford, Connecticut; The Royal Shakespeare Company in Stratford-upon-Avon, England; and The Actors Center in New York City. In addition to a wide variety of stage and television productions, Krasinski worked as script intern on Late Night with Conan O’Brien. His role as Jim Halpert on The Office brought him to the public’s attention but he contributed more than Jim’s character. He’s directed several episodes and filmed the TV show’s opening credits and footage of Scranton, Pennsylvania. He’s involved as writer and producer on several projects for film and screen. Source: Rivera, Zayda. 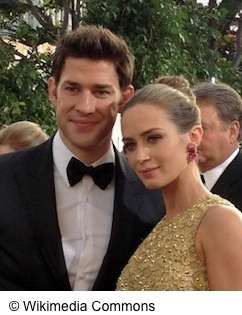 “Emily Blunt, husband John Krasinski welcome baby girl Hazel.” NY Daily News. NYDailyNews.com. Feb 16, 2014. Web. Feb 20, 2014.